It was considerable - and it was heartbreaking. The Ploughing was something they had relied on. The crushed marquees and scattered debris were all that remained of a crucial cornerstone of their financial year. The patrons had long deserted, having first been delayed until 11am, then noon before being told it was cancelled, forcing them to endure a long stream of traffic out of the place again. "They should have cancelled it last night," said John Nestor, who faced a two-hour journey back to Athlacca, Limerick. Back on site, danger lurked. At one stand, a set of glass windows had completely caved in, shattering shards very close to a pen filled with sheep. "I had a sleepless night thinking of the poor animals," said one volunteer. "Everything else can be fixed." Inside the large, deserted marquee of the Department of Community and Rural Development, leaflets advertising Heritage Week were scattered on the floor, along with broken glass. The only spot where serenity reigned was - oddly enough - the actual ploughing competitions, which were still under way regardless. 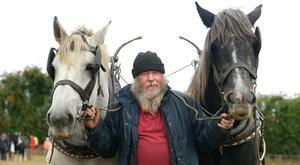 Though Moss Trent, from Curraheen, Tralee, Co Kerry, said his two horses, Elton and Larry, did not like the wind in their ears as they helped him carve out careful furrows and ridges. "A horse always likes his backside to the wind," he said. Watching the ploughing from her car, doyenne of the event, Anna May McHugh, admitted she was disappointed. All the signs had pointed to the breaking of new records this year, she said. But health and safety had to be top of the agenda. They had sat down with Met Éireann, gardaí and health and safety officials for hours at a meeting the night before, updating weather reports every 15 minutes as they agonised over the decision to postpone. "We thought the winds would have died down by now," she said. Almost in tears, Claire Flaherty, of Leisure Horse Ireland, stood amid what remained of the Blackwater Marquee where they had paid €2,000 for a corner stand - along with paying for five members of staff to operate the stall, and the cost of their accommodation. Little remained now but a pile of light metal poles and plastic. "We were hours waiting in the car park before we were allowed inside," said Claire. Caoimhe Flynn and Jane Jackson, from environmental group 80 Emissions, were also in the Blackwater tent. "Where do you even start?" said Jane. "They asked would we come back but where would they put us?" 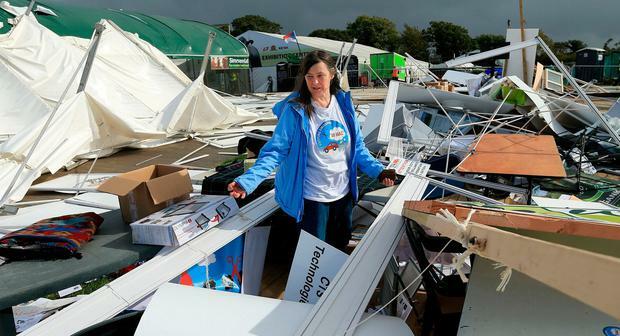 Maura Walsh, chief executive of IRD Duhallow, a rural development group, stood in disbelief as she surveyed the damage to the Kerry County Council tent where they had been based. "We never knew it would be this bad. Never, never," she said. 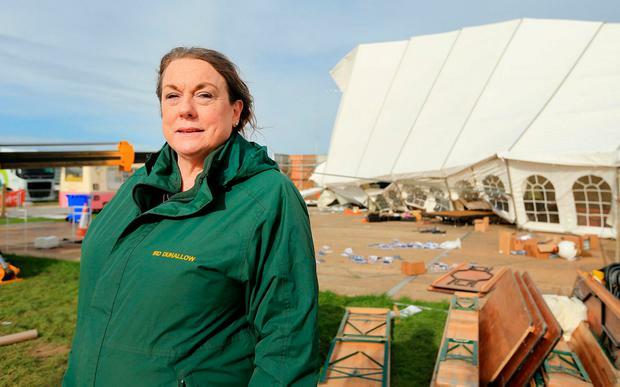 Almost half the marquee had been lifted off its wooden platform and folded back over itself by the devastating winds. Almost everything within had been destroyed. IRD Duhallow lost thousands of euro worth of vital equipment, including a microscope it used to educate children about water pollution, as well as two large fridges and a bain-marie used for its meals-on-wheels service. It also had to throw out around 200 chilled meals which it had been planning on selling at the Ploughing Championships to raise some €4,000 which had already been earmarked for a new display fridge at the centre. "But I don't blame the organisers. Nobody would have predicted this," she said. 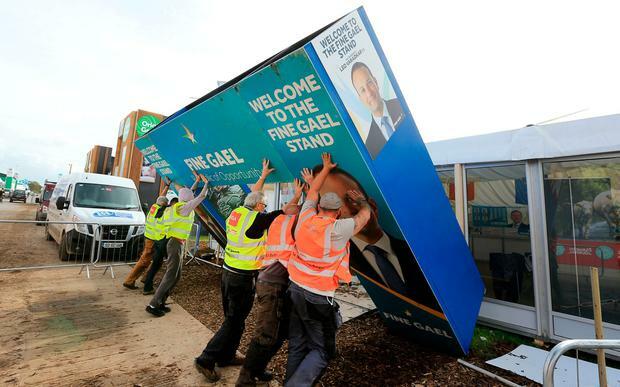 One of the first tents to be repaired was the Fine Gael marquee. It took six men to lift the wooden facade back into place. "You're making a comeback, Leo," they roared.